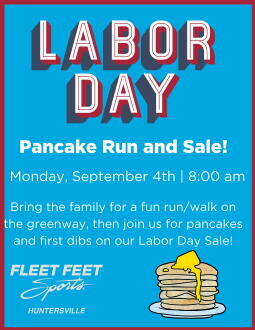 Bring the family for a fun run/walk on the greenway, then join us for pancakes and OJ! Free! We'll have Labor Day sales - and you'll get first dibs! In consideration of the foregoing, I, for myself, my heirs, executors, administrators, personal representatives, successors and assigns, waive and release any and all rights, claims, and causes of action I have or may have against Fleet Feet Sports and their affiliates, their agents, employees, officers, directors, volunteers, successors and assigns, that may arise as a result of my traveling to, participation in, or traveling home, from the above captioned activity. I attest and verify that I am physically fit and have sufficiently trained for the above captioned activity, and a licensed medical doctor has verified my physical condition. Further, I hereby grant full permission to any and all of the foregoing to use any photographs, motion pictures, recordings or any other record of this event for any legitimate purpose, including commercial advertising without monetary payment to me.